Patrick had been in communication w/Bro. Tamang for some time and he had arranged much of our stay, hotel, meeting rooms, restaurants, etc. Bro. 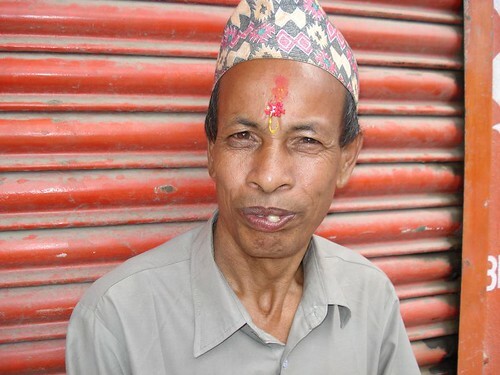 Tamang greeted us by placing delicate yellow welcoming sashes around our necks and it was off to the hotel. They told me I could ride up front so naturally I walked to the passenger side ... and there was a steering wheel there! We all laughed and I went around to the other side. (This has happened several times!) Then we headed into town, to our hotel and to our beds! Sunday morning we arose with anticipation of being able to worship with other believers. 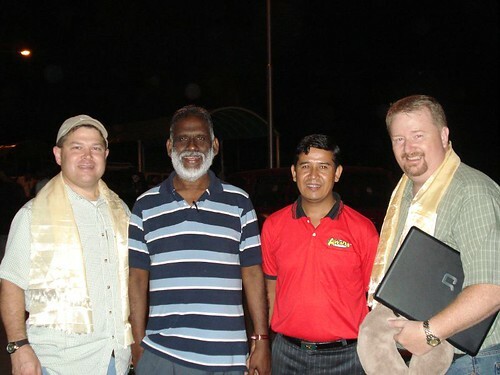 Prio to heading out to church some of the brothers met us at the hotel and we had a wonderful breakfast together. We would be meeting with 6 candidates from all across Nepal and they would be arriving throughout the day. Our official meetings will begin tomorrow. We had arranged to attend an English service at the Lalitpur Baptist Church. In Nepal Christian churches worship on Saturday because that is the government prescribed day off. 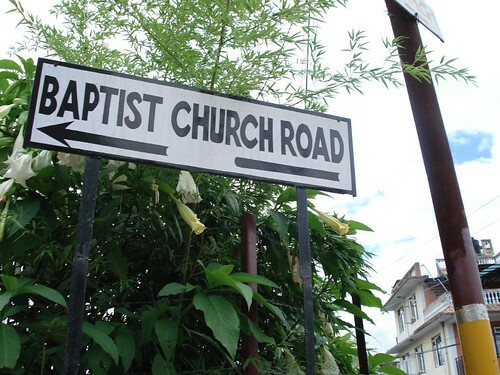 Sunday is the first day of the work week, but Lalitpur Baptist Church holds a special service on Sundays for the English speaking congregation, in addition to their regular service on Saturday for the Nepalese members. There were people from several nationalities, including several from Liberia, Africa who are working with the UN monitoring the elections and the transfer of power here in Nepal. It was delightful to worship with Christians from many different countries, singing familiar hymns such as “Holy, Holy, Holy” and “What a Friend We Have in Jesus”. 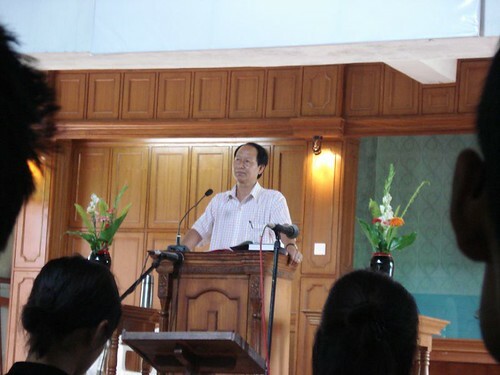 There was a guest speaker that morning who is the Nepalese representative of DAWN – Discipling A Whole Nation. He shared a wonderful message about missions and lauded the church where we were worshiping at because they had recently sent out 2 missionaries – one to Malaysia and one to the growing Nepal community in the UK!!! What an exciting thing it is to see the national churches understanding and taking on the Great Commission! After church we headed back to the hotel and let me tell you, driving through Nepal is quite an experience! First of all, driving on the opposite side of the road is nerve-wracking. Then there's the aspect that there appear to be no traffic laws ... honking, weaving, gesturing are all the norm. But it's still scary from the front left seat with no steering wheel, and more importantly, no brake pedal! After a wonderful lunch at a restaurant across the way, I tried to get online at the hotel to update the blog, and that was a frustrating experience. There is an Internet connection in the lobby so in the morning before church I had been able to briefly get online to check email and chat with my beautiful wife, and the connection had been ok. But in the afternoon it was horribly slow. After a couple of hours attempting to upload pictures I went across the street to an Internet cafe and tried from there. The connection was a little faster and after 3 ½ hours I was able to complete the blog, upload the pictures and send a brief video greeting for Christian Challenge's Sunday morning service. Interestingly, moving across the street was another of God's coincidences. From the second floor level of the Internet cafe I was able to plainly see the happenings outside in the square. There were two giant structures mounted on ancient carts, decorated with ribbons. Throughout the day the crowd swelled until there were literally thousands crowded around in a festival atmosphere. The army was on hand to provide crowd control, along with mounted police. Buddhist monks paraded into the square and a military band played in preparation for the big event. The Prime Minister climbed aboard the larger of the two carts and at the culmination of the event displayed a jeweled vest to the cheering crowd. These carts were built to honor one of the many gods of the valley. The rain god was celebrated for providing nourishment to the ground in preparation for the planting and harvest. 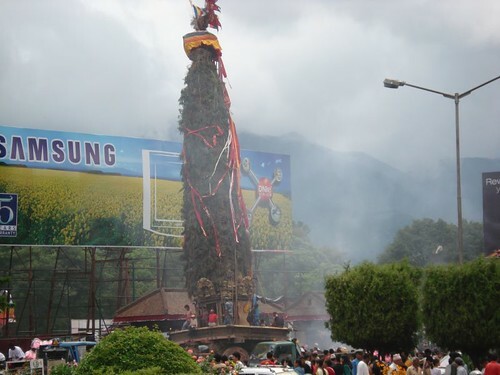 Supposedly hundreds of years ago one particularly pious farmer had been awarded the jeweled vest directly from the rain god and each year at this festival that act is celebrated in hopes of appeasing the god for one more year. As I watched the crowd I felt what Paul must have felt in Athens (Acts 17:16) as he observed the false gods being celebrated in that city. How I grieved for these people who try to appease their many deities in an attempt to scrape out an existence. If they only knew that the true God who created all that they worship longs to welcome them into His family, to forgive their sins, to give them a real reason to worship out of love, not fear! Lord, help us tell them! Please pray for us that the Lord will allow us to communicate clearly the vision and mission of CSC and have discernment as to each person's involvement in CSC as well as who the national director should be. Thank you again for the spiritual support! P.S. I've uploaded a few more pictures to: http://www.flickr.com/photos/nathanmartin/sets/72157600727895094/. I haven't had a chance to add descriptions but perhaps you will enjoy them anyhow. All these pictures serve to put a face on what is happening in that part of the world. Keep them coming. I think it would be good to put your blog reports in a binder for the CCI library. It touched my heart to know about the Baptist Church with 400 members, and to see how many other Christian ministries are making inroads into Nepal. Of course we know who is behind all these barriers colming down. One thing that I really appreciate about your trip is that they show the homework in place beforehand. Patrick did a great job determining who CSC needed to meet with. Without careful planning it is so easy to pick up a rogue. On the home front, as for the two ministries on Sunday, they didn't tire me at all. I am very much enlivened. (The Word of God makes you alive.) It reminds me a bit of the early days of Christian Challenge when I was doing seven ministries a week. Everything is going well here. Had a pretty good turn out Sunday morning. The Sunday evening group is also doing quite well. We have between 25 to 30 with us. It a very relaxing time. Last evening I sat on a stool during the ministry. Had plenty of input from the members. I love it when sharing time comes. Son, you can be sure that your requests for prayer are taken seriously. This trip is well covered. 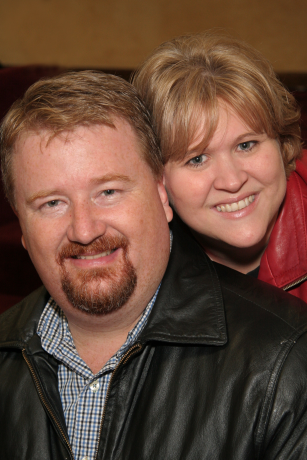 We are looking forward to you sharing with Christian Challenge at our general membership meeting on the 22nd. Thanks for the kind words. I'm really enjoying chronicling this trip electronically. To be able to share pictures and an occasional video is definitely a neat way to connect with the prayer warriors back home. Of course, at this rate, I might not have anything unshared left for our general membership meeting! :) And we can definitely feel the prayer support! Seriously! I've got to run, but thanks for the update!